LeBron James is leaving the Cleveland Cavaliers, effectively his hometown team, for the second time in his NBA career to wear #23 for the Los Angeles Lakers. 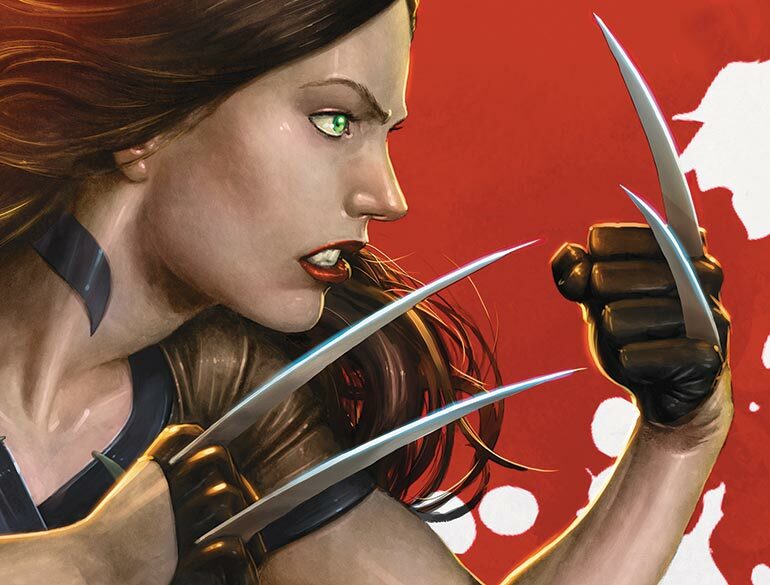 Laura Kinney, after taking up the mantle of Wolverine after her “father’s” death, is going back to X-23 for the debut of her eponymous new series. Coincidence? Probably, but it’s a serendipity worth playing with, especially since there’s been so much chatter about them both. In Laura’s case, the baggage of a female legacy character losing primacy to her male predecessor weighs heavily over her new title. At first blush it looks a lot like more of the same one step forward and two steps back struggles that Marvel and DC have both had with elevating female, queer, and POC heroes into marquee roles, but considering the transition from Tom Taylor’s tenure on All New Wolverine to Mariko Tamaki’s incoming role on the latest volume X-23 through the lens of James’ career trajectory offers a compelling counternarrative. While there may have been some carnage always left behind when he made these kinds of moves, in Cleveland and also in Miami, he did the right thing. I just finally came to accept the realization that he and his family said, ‘You’ll never, ever be accepted back in your hometown if you don’t go back to try to win a title. Otherwise someday you’ll go back there and have the scarlet letter on your back. You’ll be the greatest player in the history of mankind, but back there, nobody’s really going to accept you. It’s a mission that James fulfilled in 2016, winning a championship in his hometown and clearing the way for his impending move to the Lakers, where he’ll begin the next chapter of his career: finding a way to take down the ascendant Golden State Warriors. In hindsight, James’ second run in Cleveland is the best way to look at what Tom Taylor set out to achieve with All New Wolverine: a homecoming and an exorcism of lingering expectations that was never meant to last forever. When Taylor debuted with David Lopez and David Navarrot, he took great pains to position what they intended to do within the context of her fractured, deeply problematic history by going back to Laura’s time on X-Force to chart a path forward for her to work through what Logan meant to her and what she could make the name Wolverine mean. It reshaped her into a hero defined by empathy determined to take on more pain than she caused and gave her a family of misfits tied together by biology that chose to make it something more, most notably her “little sister” Gabby, a tweenage clone of Laura gifted the name Honey Badger by none other than Daken. 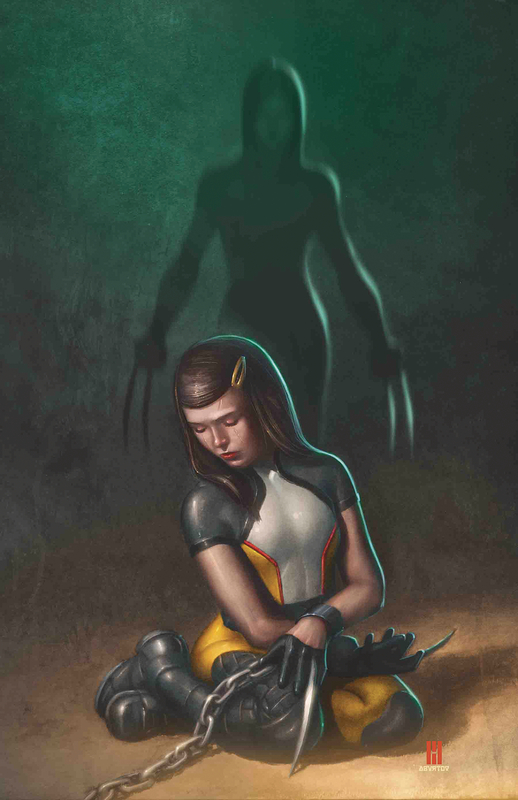 When All New Wolverine ended at issue #35, it closed out a chapter in Laura’s life that was rooted not just in her own past, but one that was purpose built to take her through all of the most iconic places and experiences of her father’s life, an initiation that was as much of a test as it was an education. For readers, it was a surrealist kind of nostalgia, seeing a new character in familiar places facing familiar threats. The brilliance of All New Wolverine wasn’t in creating new things, it was how it brought out the nuances of Laura’s identity, as a woman and a clone, leading to different responses and outcomes than Logan had when he faced them. Which is why All New Wolverine was brilliant, necessary, and necessarily temporary. Taylor and his artistic collaborators unburdened Laura, opening up a future for her where she has nothing left to prove and is a marquee character in her own right under her own name. 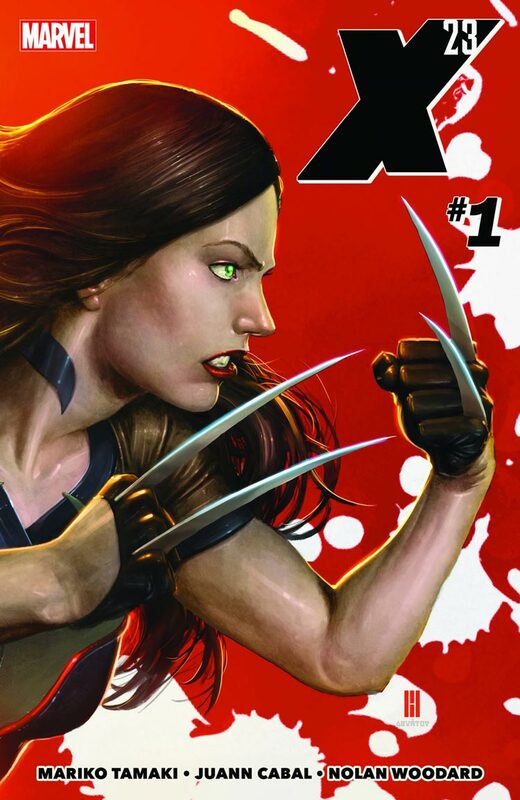 Which is why returning her, and the title to X-23 is forward instead of backwards progress. It’s a spirit and an unburdening that electrifies Tamaki’s debut alongside Juann Cabal, arguably the best and most memorable interior artist on All New Wolverine, giving the new beginning just enough of a sense of continuity to bridge the gap and assure readers that this is, in fact, forward momentum for both Laura and Gabby. The kind of seamless transfer of power between Taylor and Tamaki is a rare phenomenon in superhero comics, and only really has Scott Snyder handing off Batman to Tom King as a recent precedent. Both companies have struggled to maintain the heat of an iconic run, especially when it comes to female lead titles. Wonder Woman has been a particularly gruesome journey in recent years, struggling through the wilderness of Meredith Finch’s run following the popular if troubling partnership between Brian Azzarello and Cliff Chiang prior to Greg Rucka’s return to the title with Liam Sharp and Nicola Scott. Following Rucka, and a novel stop gap arc from Shea Fontana, it plunged into an incomprehensible mess that James Robinson was tasked with executing and we won’t see lasting relief from until G. Willow Wilson takes over in November. It’s hardly the only recent example, either. Joelle Jones’ brand new Catwoman series may be drawing accolades, but it’s a renewal that comes years after Genevieve Valentine’s insurgent tenure was followed by an indifferent arc by Frank Tieri and Inaki Miranda. Even the white hot Harley Quinn empire is teetering on the brink of going fallow. Instead of lining up a fresh team to take over from Conner and Palmiotti, Tieri was again slotted in as a stop gap until incoming writer Sam Humphries was announced. It’s a pattern that repeats itself over and over again in major titles, leading to increasingly fractured reading experiences and a disincentive to follow a given title for more than a year or two at most. Tom Taylor getting a full thirty five issues to complete his vision for Laura is an accomplishment all on its own, even more so for Conner and Palmiotti’s reign of terror, but there is, for the most part, an astonishing indifference to the concept of dynasty in contemporary superhero comics. When LeBron James left Miami in 2014, Pat Riley was understandably livid, watching the prospect of creating a dynasty to rival the ones that Phil Jackson coached in Los Angeles and Chicago evaporate into thin air and the Heat are still wandering the wilderness as James prepares to join the Lakers. By comparison, outside of a couple crown jewels, both Marvel and DC seem to be content to let individual franchises wither into oblivion when a hot creative team moves on. In one sense, the readership’s major shift over the last decade to prioritizing following the work of individual creators over characters has been a boon, elevating mostly writers into being able to take the following for their superhero comics with them into creator owned passion projects, but a lack of a concerted effort on Marvel and DC’s part to execute succession plans on insurgent or resurgent properties to compensate has had a brutal effect on what should be one of the greatest strengths of superhero storytelling. One of the truly transcendent qualities of superhero fiction, a key virtue of Taylor’s work on All New Wolverine that appears to be on full display in Tamaki’s debut is the act of participating in a relatively open, ongoing mythology that builds on what came before it. There’s definitely a lot of fun to be had by tracking a given writer or artist across titles, seeing how their sensibilities adapt to the assignment in question, but that’s a phenomenon that operates almost identically across every popular medium You can evaluate how Kenneth Branaugh adapts to Shakespeare, Marvel super-heroes, and Disney princesses across his body of work the same way that you can track how Matt Fraction adapts to The Punisher, Thor, and Hawkeye. What makes superhero comics so valuable and vital as a tradition is being able to take that idea even further by looking at what Warren Ellis, Matt Fraction, Kieron Gillen, and Brian Michael Bendis have successively brought to Iron Man and how each’s vision has impacted the others’. Where that principle really takes flight is when dynasties emerge, when the preceding run is still hot to the touch when the next one begins. That’s what’s made Batman such an essential part of the wider comics conversation for the entire decade, moving almost unbroken from Grant Morrison to Scott Snyder to Tom King, with a vibrant set of related titles fanning out from it. It’s also how Tamaki and Cabal’s X-23 #1 burns so bright and so hot. 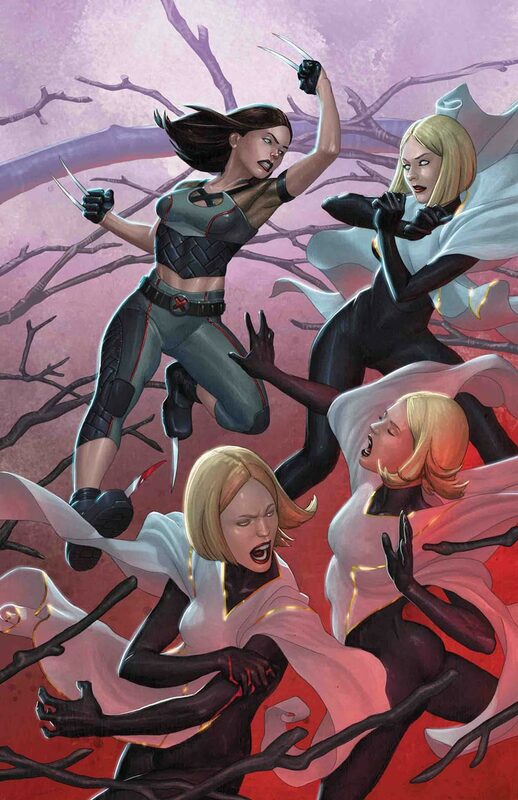 X-23 has never been given the chance at a dynasty until this exact moment of time. 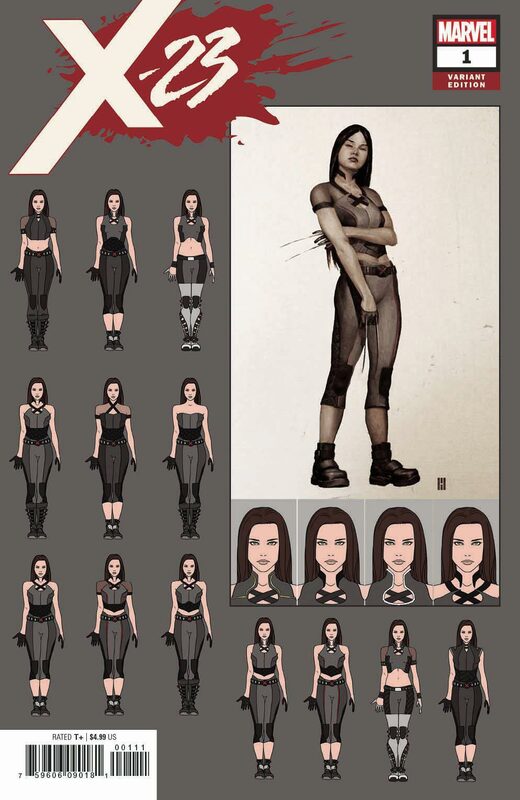 Since her inauspicious debut in NYX, Laura’s major appearances were confined to successive mini series and supporting roles, with Marjorie Liu’s 21 issue tenure on X-23 (Volume 3) being the only coherent, focused narrative for Laura prior to All New Wolverine. Which is why Taylor had to, and did, pull all those threads together into a vision that could sell Laura as the main event that she was always meant to be and never been. 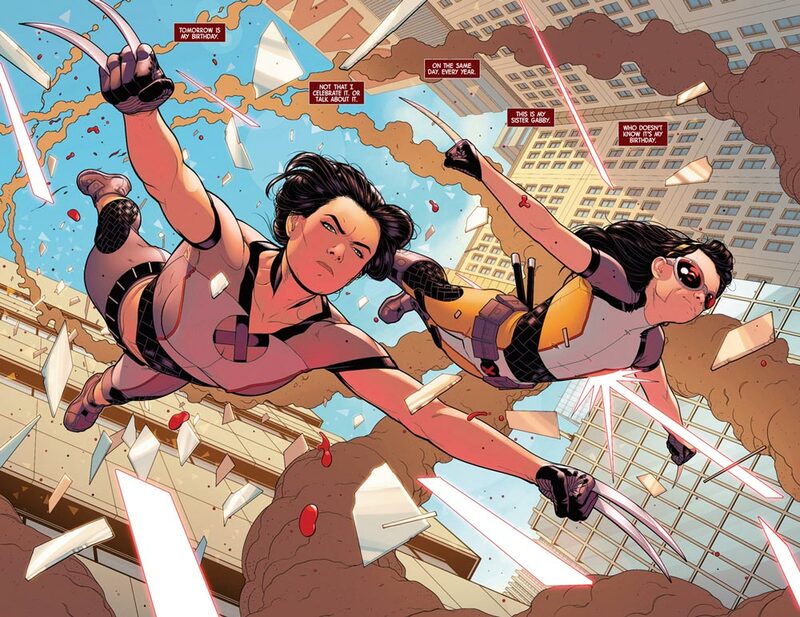 It’s why Cabal’s opening splash page of Laura and Gabby soaring down the side of a building crackles with electricity and glides through a kinetic, multi page action sequence with ease. We know who Laura and Gabby are, we’re connected and invested in them. When Taylor, Lopez, and Navarrot introduced Laura battling up and down the Eiffel Tower, they had to invent a new visual language for her, they had to build from scratch and sell us on it in the same breath. We know how spectacularly successful that was, because we speak that language fluently now. 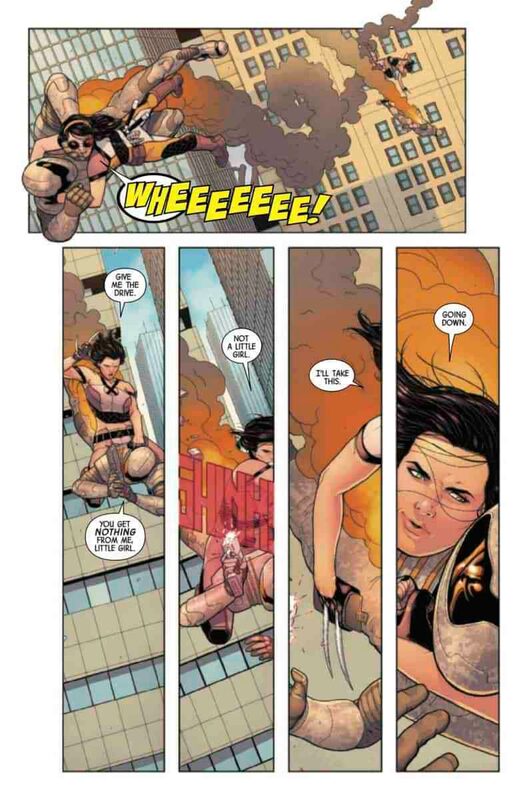 Laura’s movements, the hows and the whys of it, are implicit, letting Cabal take the lead in a breathtaking exploitation of perspective and human kinetics beyond what he could do on All New Wolverine. It also unburdens Tamaki and lets her roll out novel perspectives on the X-Men mythos without wading through history or exposition. It pays immediate dividends in the Stepford Cuckoos, who Tamaki presents as a fascinating foil for Laura and Gabby, clones like them, but equipped with polar opposite abilities, aesthetics, and outlooks. The Cuckoos also become a vehicle for Cabal to employ fashion and costuming in service to storytelling in ways that never came into play in his All New Wolverine work. Laura’s spartan outlook on life never leaves room for the kind of flourishes that are demanded of any effective portrayal of the Cuckoos, and so new opportunities emerge, which Cabal delivers brilliantly on. Outfitted in loose white severely structured ponchos with gold embellishments, the girls are the very picture of their mother, but the liquid black bodysuits and platforms they wear underneath function as an early indicator of the gothic presence that they occupy in the story. It’s the same kind of space that Tamaki has to immediately dive into deeper philosophical questions about how to adapt normative social conventions to the reality of living as a clone, emerging in the debut issue with the question of whether clones have birthdays and how to celebrate them. Laura doesn’t see a purpose for them, Gabby wants one because she’s a child who gets joy and comfort from little social conventions, and the Cuckoos interpret them as a deliberate expression of agency that they maintain through carefully executed ritual. It’s part and parcel of a novel approach to the mutant metaphor shared by Taylor’s conception of family spun out across All New Wolverine. In Taylor’s hands, the genetic material shared by Laura, Gabby, Old Man Logan, Daken, Deadpool, Sabretooth, and Lady Deathstrike was meaningless until it was given meaning by the bonds that Gabby worked to establish between them, creating a unique perspective on the notion of chosen family. In both instances, what Taylor and Tamaki achieve are dialectics about the unique social conventions and constructs that mutants build for themselves that have parallels and corollaries in the queer community without misappropriating or exploiting lived queer experiences. It’s particularly affecting in X-23 #1 when they say they chose their birthday based on one of their numbers’ favorite actors. The idea is utterly unique to the X-Men, but at the same time, the language used and general concept align very closely with the various ways that trans people choose names that align with their gender and broader conception of self. It’s a small piece of a much larger rethinking of how the mutant metaphor can and should operate in 2018 and beyond. But this isn’t a strictly linear relationship that begins and ends with Tamaki standing on Taylor’s shoulders, or Taylor on Liu’s, etc. What Tamaki illuminates can work to accentuate Taylor’s work in hindsight, just as much as Taylor created precedent for Tamaki to build on. Fundamentally, this is a pair of writers who are uniquely attuned to the character and bring out distinct qualities in the artists they collaborate with, but what they vindicate when taken together as part of a whole is that superhero comics thrive on precedent, continuity, and dynasty. Laura Kinney isn’t Marvel’s marquee hero because of Tom Taylor or Mariko Tamaki. Laura Kinney is Marvel’s marquee hero because Taylor and Tamaki understand that viewing superhero comics as a team sport means more than appreciating the people you’re immediately surrounded by, it means learning from the people who came before you and leaving a legacy worth following for the people who come next.